This beach ranks #6 of the "Best beaches in the Caribbean"
Most hotels are of all inclusive format, and are quite expensive by standards of Dominican Republic. 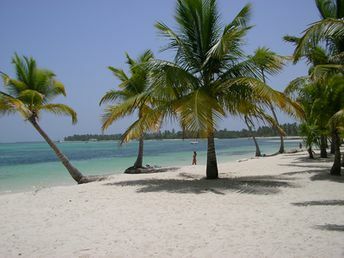 There are some cheap guesthouses and self-catering apartments near Playa El Cortecito beach. There is also a large supermarket. Fly to Punta Cana International Airport (PUJ). Than take a taxi. The beach is beautiful - white sand and lots of palm trees, but packed with hotels. There is small palm grove without hotels in southern Bavaro, but even here smells of gasoline from motor boats passing around.